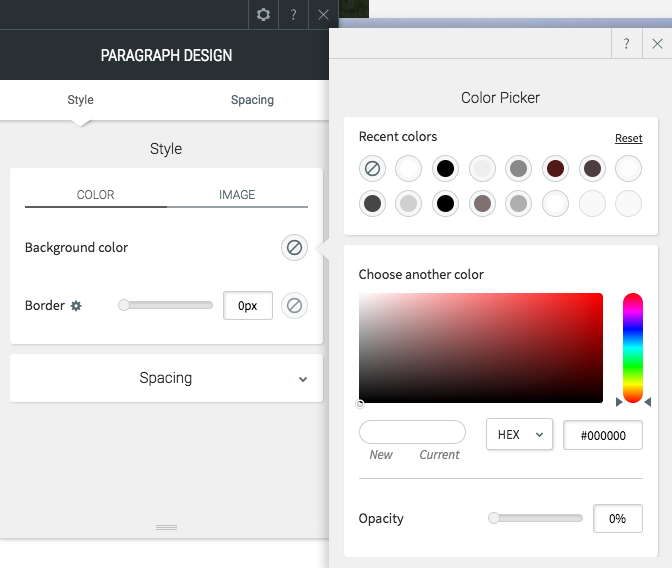 Within the design options of columns, rows, and widgets, you can alter the color of elements and backgrounds by clicking the round icon to open the Color Picker. 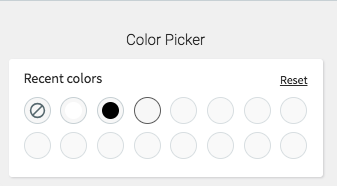 Your recent colors will show up in the Color Picker, so you can easily apply consistent colors throughout your site. 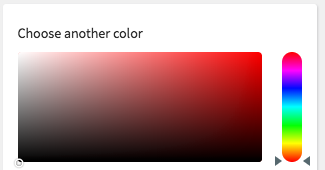 The color picker also allows you to select a new color from the panel and alter the hue with the color gradient on the right. Alternatively, if you have a specific set of brand colors you can enter the hexadecimal or RGB value. You can adjust the transparency of the element by using the Opacity slider. As you adjust the opacity of the element it will fade into the background (and disappear into the background element at 0%).